File: Ganga Maya Adhikari, mother of Krishna Prasad Adhikari, who was killed during the armed conflict. 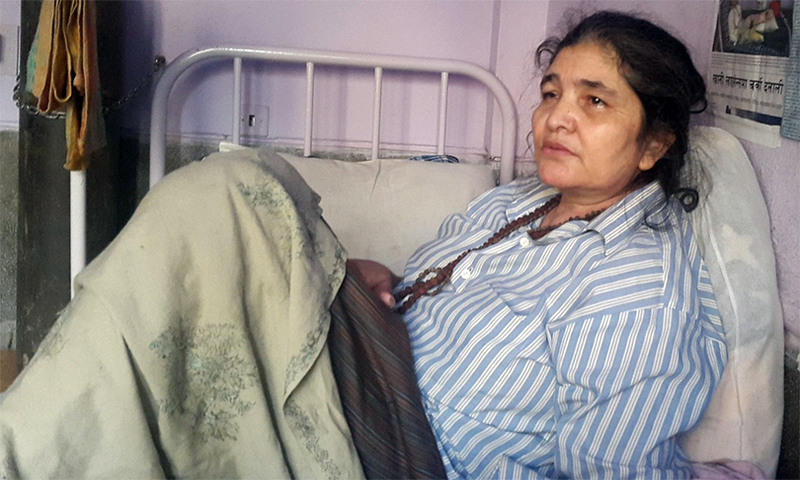 After one of the key suspects of 2004 murder of Krishna Prasad Adhikari surrendered to the Supreme Court on Sunday, the government has requested the victim’s mother Ganga Maya to end her fast-unto-death. Chhabilal Paudel had showed up at the Supreme Court yesterday, and he has now been taken to the judicial custody at Dillibazaar Prison. Following that, the government has requested human rights activists including Subodh Raj Pyakurel and Kanak Mani Dixit to convince Ganga Maya to break the fast, according to a minister. The woman, however, has insisted that action must be ensured against the perpetrators and the arrest is not enough as he might be released later. Attorney General Agni Kharel says the government has disseminated the message to Ganga Maya that there is not any hurdle in the action against perpetrators because the suspect has been sent to custody as a part of implementing the verdict. Another source says the woman might end her fast today itself. If everything goes as planned, Minister for Law, Justice and Parliamentary Affairs Sher Bahadur Tamang will give her juice to end the fast this afternoon.